There’s always a real buzz and a warm welcome at Living Well Partnership headquarters in Effra Road, Brixton. Light streams through the glass environs and everyone looks engaged. Meanwhile, the new Young Adults project is doing sterling work putting together a young people’s resource pack and are “key to our future development”, adds Lee. Things are really shaping up as a recent focus day revealed. “It was really positive with lots of energy, ideas and fun, ” says Chief Executive and Clubhouse stalwart Maresa Ness. “The work was done with staff and members together and then trustees joined the day to hear the unit priorities and discuss strategic priorities, such as fundraising, Transitional Employment Programmes (TEPs), personalisation and enablement.There were presentations from each of the units (Business & Administration, Employment and Education, Hospitality & Horticulture) and one of the main priorities focused on “evaluating how we have been working since we moved in and how we can improve things, such as training,” adds Maresa. Mosaic’s partnership with the Lambeth Collaborative, as hosts of the centre started a year ago, but Maresa’s involvement with the clubhouse (part of an international movement) dates back 20 years. Maresa helped set up the original clubhouse at a time when Lambeth was known as ‘the psychosis capital of Europe’ (see her moving account of ‘my brilliant moment’ in the video at the bottom of the page). Since it opened 129 people were supported through the information hub. The focus day examined the 12-week programme and how people can be supported to meet their goals through short term access to the initiatives and opportunities on offer both in-house, with partners and in the wider community. At the heart of all the work is peer support and nowhere is this more wonderfully illustrated than in the in-reach work at Lambeth hospital. “I have seen some amazing changes in patients,” says Programme Manager Beverley Randall of the project that brings people daily from the ward to the centre to take part in activities (read more). Clubhouse member and driver John recently took people to the seaside at Whitstable. “We read out some poetry on the beach after going for a fish and chip lunch that was so fresh, I can’t remember ever having fish that tasted so good, ” he relishes (read John’s trip report). So just a year on it looks like the Living Well Partnership is firmly on the map. The headlines from a recent online survey reveal that there is a good level of knowledge about the range of services provided, particularly around education, training and employment. 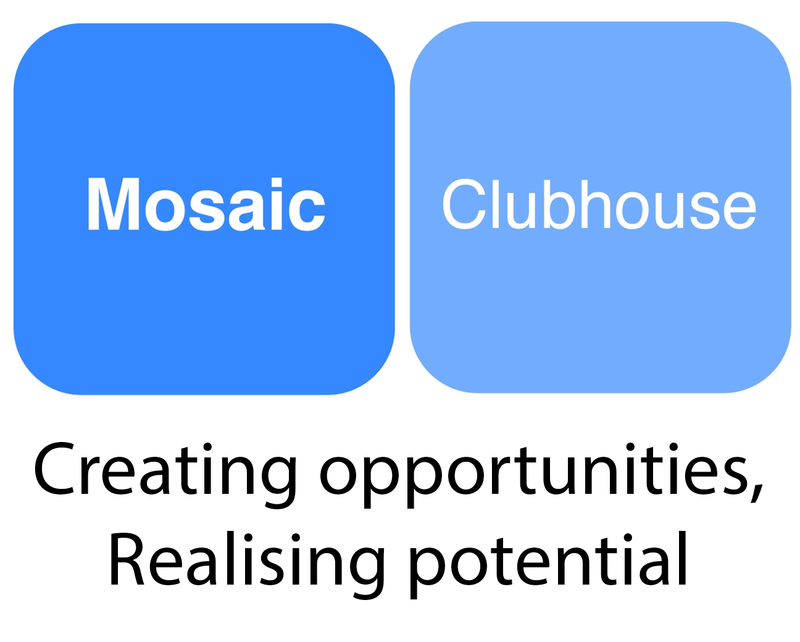 Impressions of Mosaic Clubhouse are overwhelmingly positive. Looking to the future there are many initiatives planned that will give members “more opportunities to grow, gain confidence and skills,” says Maresa. These will include “teaming” so that people can volunteer daily to be a unit “team leader”, as well as “challenge yourself Friday” where individuals are encouraged to volunteer for something they have never done before. And more people will be encouraged to work in the information hub now there is a grasp on training needs. They are also encouraging members to learn to make cheap and nutritious food at home, as well as a weekly “newsflash” so that members make a bulletin to be shown on the smart screen at Friday get togethers. There are plans for even more TEP and education opportunities and ways to make the service even more accessible to all cultures, ages and gender. The Charity Awards is organised by Civil Society Media (www.civilsociety.co.uk) and sponsored by the Charities Aid Foundation (www.cafonline.org).The Charity Times awards will be announced in October. ‘My Brilliant Moment’ broadcast on the Community Channel (SKY) 24.02.14 (06:45) & 28.02.14 (18.45).